From the “Stadium Club” to Babe Ruth’s Uniform Number to who owned the team before George Steinbrenner came along . . .
71. What is the significance of William S. Devery and Frank J. Farrell in the history of the franchise? 72. How many times did George Steinbrenner hire and fire Billy Martin? 73. Who was the 20th manager in Steinbrenner’s time? A. Billy Martin B. Stump Merrill C. C. Buck Showalter D. Joe Torre? 74. Who pitched the first no-hitter against the Yankees? 75. Which former Yankees player went on to serve as president of the American League? 76. Mickey Mantle was a rookie in 1951 but a different Yankee won Rookie of the Year. Who was he? 77. What Yankee in his first four years played on four world championship teams? 78. Two Yankees came to the major leagues without having played one game in the minors. Who were they? 79. What Yankee was in the D-Day landing at Omaha Beach June 6, 1944? 80. Bob Sheppard had the nick-name “Voice of God.” Who gave him the nickname? 81. Who had the idea to create the Yankee Stadium “Stadium Club”? 82. After Lou Gehrig, who became the next captain? 83. Which of the longest standing Yankee managers has the highest winning percentage? 84. The Yankees have the distinction of being the first to train outside of the USA. Where did the training take place? 85. All played for Yankees and Mets, aside from one. Who is he? 86. What Yankee recorded the most steals of home? 87. Easy one – Babe Ruth’s uniform number? 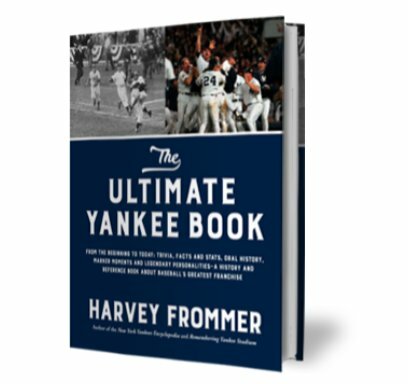 88. Who hit the first home run in the new Yankee Stadium? How did the Babe get the number? 89. Another easy one. Who owned Yankees before the Steinbrenners? 90. Joe DiMaggio played his entire career for the Yankees. What team did he coach for? 91. When David Wells became a Yankee for the first time, what uniform number did he request and why? 71. They were owners of the Highlanders Yankees from (1903-1915). 91. Three was number he requested because it was number worn by Babe Ruth who he admired. The number has long been retired. The Away Game by Sebastian Abbot ( Norton, $26.95, 284 pages) is a worthy read focused in the main as its sub-title suggests on “the Epic Search for Soccer’s Next Superstars.” Joy, frustration, anger, exhilaration and more intermingle in the book’s pages as we are there with the boys of Senegal, Ghana, other countries of Africa all involved in the quests of their lives.